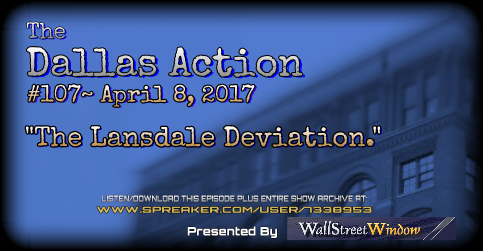 The Dallas Action #106~March 25,2017: “The Assassination Parables”, with Dr. Walt Brown. 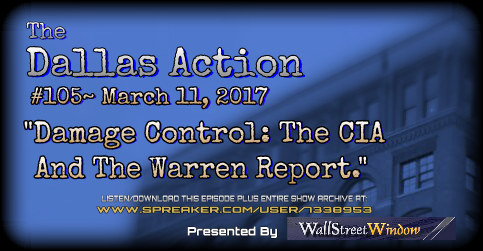 IN THIS EPISODE~ Author and Historian Dr. Walt Brown (author of “The People V. Lee Harvey Oswald”, “The Guns Of Texas”, “Treachery In Dallas”, The Kennedy Execution”, “The Warren Ommission” and The Herculean “Analytical Historical Chronology Of The JFK Assassination”) is BACK on the show for another conversation. We’re going to take a fascinating trip through Time & with Dr. Walt as he tells the unknown stories and compelling details behind the most pivotal and notorious Political Assassinations~and assassination attempts~ in history. From Julius Caesar to Anwar Sadat, Dr. Walt will relay the tale~AND tell us how the backgrounds of these events should inform our analysis of the Kennnedy Execution. IN THIS EPISODE~ In 2014, the CIA declassified~with redactions, of course~ a formerly Top Secret Internal History of the John McCone tenure as Director Of Central Intelligence. And contained within this report are true Keen Insights into the dynamics of the relationship between McCone’s Agency and the Warren Commission during the whitewa–errrr, I mean “investigation” of Kennedy’s murder. We’re going to break down and analyze the Agency’s version of events 54 years ago, and try and shed some light on the feud that erupted between Hoover & the FBI and McCone & the Agency over Mexico City Operations.